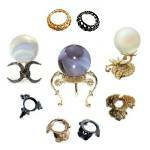 These stunning Cat's Eye crystal balls are available in 15 vibrant colors. Crystals are used as Feng Shui tools to clear negative energy and increase the positive Chi energy in dark corners. 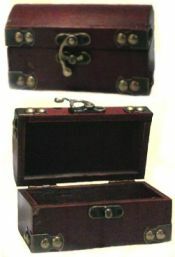 Each comes with it's own oriental wood stand. 5-Pointed Star in dozens of beautifully polished gemstone varieties. Cosmic symbols remind us of our link to the infinite. Sun, Moon and Stars carvings are for intuition, growth and inspiration. 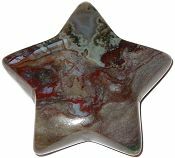 Colorful Puff Star carving in Fancy Jasper which comes in a variety of colors and patterns that only Nature can conceive. 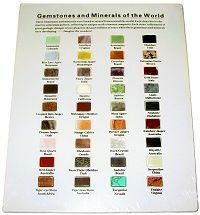 Jasper is a mystical stone, said to stimulate creative visualization and increase global awareness. 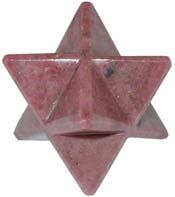 8-Pointed Merkaba also known as Star Tetrahedron and Flower of Life in beautifully polished 14 gemstone varieties. Mer-Ka-Ba means Light-Spirit-Body in ancient Egyptian and Chariot in the Book of Ezekiel. In essence it is the Sacred Geometry or form of Chi, Prana or the Life energy that infuses living beings and is referred to universally by ancient and modern cultures. 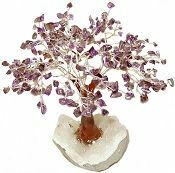 Exquisite Custom Gem Trees on a solid Amethyst Druze Crystal Cluster base. 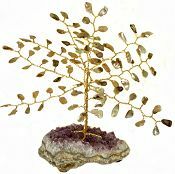 These USA custom made Medium Gem Trees have 10 branches with approximately 80-100 individual polished gem stones on each tree. 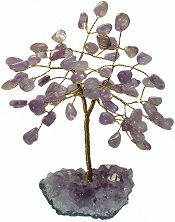 The branches are no tarnish gold tone metal wire and the Amethyst Druze bases have felt pads for scratch protection. 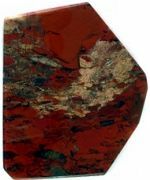 Brazilian Agate Geodes are sliced and polished to create natural bookends that show off the beauty of both the rough and polished stone. Pink Dyed Agate bookends have two polished sides for each bookend. The bases have a felt lining. Each pair is a unique size and weighs 2lbs or more. Brazilian Agate Geodes are sliced and polished vertically to create a natural candle lamp or votive that let's the candle light glow through the polished translucent agate face. Teal Dyed Agate candle lamp has a smooth drilled hole 1 1/2" W x 3" D for a tea light candle. The base has a felt lining. Each piece is a unique size and weighs 1lbs 10ozs or more.